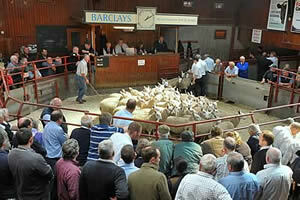 The Cumberland & Dumfriesshire Farmers Mart had forward 5,186 store lambs and 1,269 breeding sheep at their sale at Longtown on Tuesday 2nd November, 2010. More distant buyers and another good show saw all classes sharper. Store lambs sold to a top of £74 for Beltex’s from Newlands; North Country Cheviot £69.80, £68.80 Haithwaite; Texel £67, £66 The Height, £64 Newton; Suffolk £65 Coshogle, £64 Risehead, £63 Lamberton; Greyface £60, £56.50 Low Stokoe; Blackface £60 Horseholme, £57 Gibbs Hill, £54 Tone Hall; Charollais £58.80 Coshogle, £58 Blacksmiths Cottage; Cheviot Mule £57.50 Glenkiln; Swaledale £38.50 East Stobbylea, £36 Howburn. The 1,141 Cheviot lambs were another great trade. Top of £57.50 Stirkfield and Granton, £56 Gilmanscleugh, £54.50 Girnwood and Winterhope. Hill Bred feeding ewes to £57 East Foreshield, £53.50 Newton. Breeders were a large show for the time of year with all classes in strong demand. Top of £150 for a Suffolk ram from Lamberton. Shearlings to £88 for Cheviots from Bayles; Suffolk cross £77 Bayles; Blackface £66 Fingland. Ewe lambs to £64 for Greyfaces from Williamston; Cheviot £49 Blakehopeburnhaugh; Blackface £42 Penchrise. Correct ewes to £74 for Cheviots from Bayles; Texel £72 East Foreshield; Greyface £62 East Foreshield; Blackface £54, £50.50 Penchrise; Herdwick £49 Bayles; Jacob £47.50 Stackbraes; Swaledale £45 Low Old Shield.